Chicken Spaghetti - BEST Chicken Spaghetti Casserole Recipe! 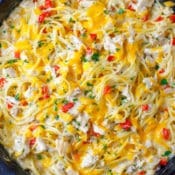 My famous creamy, cheesy chicken spaghetti is flavorful and easy to make. It may only be famous in my kitchen, but according to my family, this chicken spaghetti recipe is a weeknight dinner recipe that deserves a gold medal! It’s always really great when you can whip up a simple family dinner recipe that everyone enjoys—even your picky eaters. This chicken spaghetti recipe was passed down from my mom. I’ve made a few modifications over the years, but it’s more or less the same chicken spaghetti dish that I can remember her putting on the table when I was a kid. This isn’t your traditional red sauce spaghetti recipe! My chicken spaghetti is nice and creamy, making it a break from our normal dinner routine which is always good in my book. Here’s a little list of the flavors that make this chicken spaghetti so special! 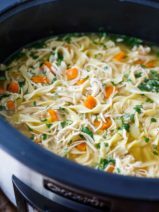 I use usually use rotisserie chicken for this dish because I find it to be tender and delicious. Plus, using rotisserie chicken it makes putting together easy casseroles like my Doritos casserole an absolute snap! Of course, you can use any kind of chicken you have on hand to make this easy chicken spaghetti recipe. 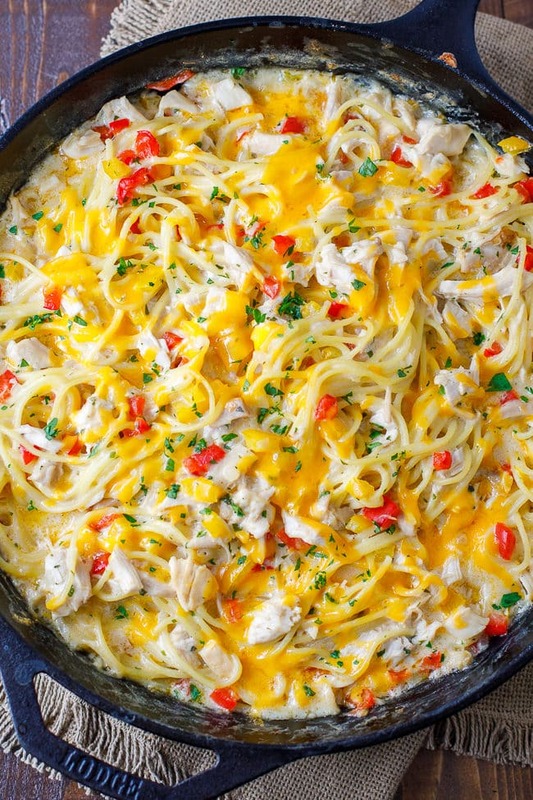 This chicken spaghetti could also easily be modified with different vegetables. If peppers aren’t your thing, broccoli would also taste amazing in this dish. The possibilities are really quite endless when it comes to simple skillet casserole recipes like this. 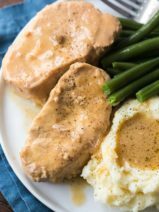 In addition to being one of my husband’s favorite family dinners, this is also a recipe that I love to make when we have family or friends staying with us. It’s always nice to make something that’s a little unique for guests, while also choosing dishes that don’t require a ton of time to prep and prepare. This dish is so easy but also presents really beautifully on a plate. That creamy sauce and the pops of color thanks to the peppers really look quite lovely. Add some fresh parsley to dress it up even more, and serve it with a warm, buttery piece of garlic toast. This really is the best chicken spaghetti recipe! 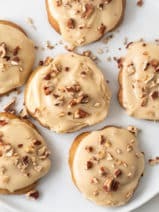 I can’t tell you how many times I’ve been asked by my friends and family members if I could share the recipe with them. In fact, that’s what finally prompted me to blog this recipe for all of you. Be sure to pin this one, you don’t want to forget about it. As I mentioned, this dish is a great alternative to traditional spaghetti recipes that utilize red sauce. It’s really gone into a more frequent dinner rotation since my husband started having some stomach issues recently. He’s sensitive to any recipes that have red sauce, which really cuts down on a lot of my tried-and-true dinner recipes. 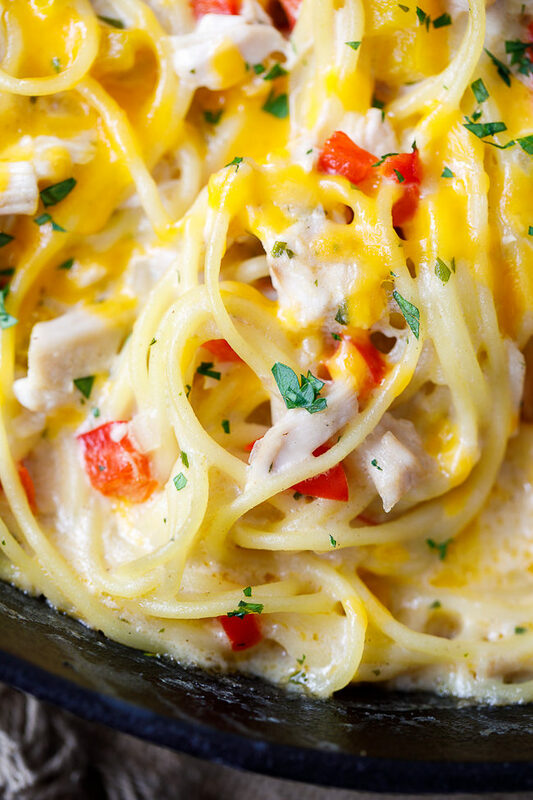 It’s great to have this cheesy and creamy chicken spaghetti dish as a dinner alternative. My husband has stomach issues that makes him sensitive to tomato sauces, so this is a wonderfully creamy alternative for him. As for me, I’m a huge fan of all that cheese. Doesn’t cheese just make everything taste better? Oh, and you can certainly use any large skillet for this tasty chicken spaghetti, but here’s the cast iron skillet that I use and recommend. 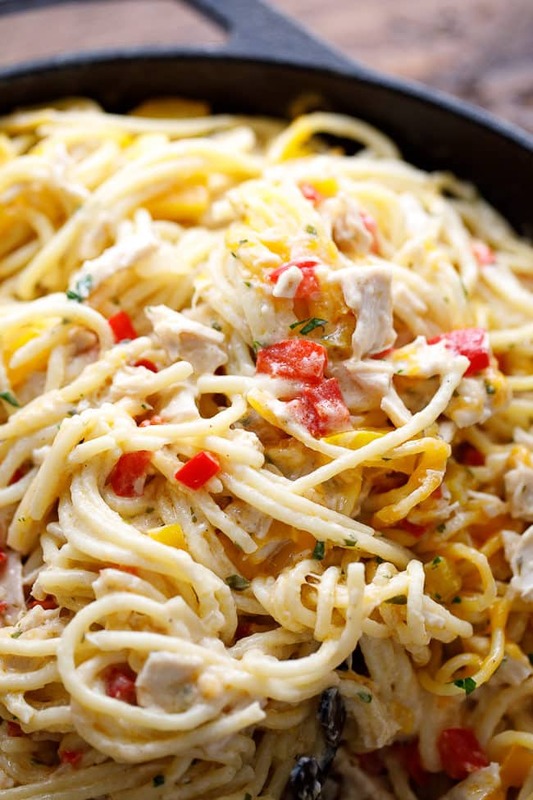 This easy, creamy chicken spaghetti is a fabulous dinner idea for those hectic weeknights. Cook spaghetti according to directions on the package. Drain and add a little oil or butter to prevent it sticking together, set aside. In a 12-inch cast iron skillet over medium heat melt the butter. Add the peppers, onion, and the garlic. Cook for 3 to 5 minutes or until vegetables are tender, stirring occasionally. Stir in the flour and cook for about 1 minute. Stir in the chicken broth and allow it to come to a boil while continuing to stir. Whisk in the half and half stirring continuously to prevent sticking. Allow it to come to a boil then stir in the grated parmesan cheese and the parsley, remove from the heat. Stir in the chicken and the pasta. Bake in the preheated oven for 18 to 20 minutes. Top with the sharp cheddar cheese. Bake 3 to 5 minutes, or until cheese is melted. Optionally, garnish with fresh parsley. I made this yesterday and the whole family loved it! Healthy and delicious recipe, I will definitely make it again! Yay, I’m so glad you liked it! Hi Janie! I’m so glad that you and your husband loved this recipe. Thanks for commenting! 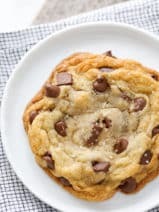 Delicious recipe, thanks for sharing! Looks great! I do like Marjorie’s crock pot method. How would I go about cooking it in the crock pot? Thanks! I am a retired teacher. However, when I was teaching middle school, I made this for my students using a crockpot. They raved over this dish. Wanted the recipe for their mothers. I copied it for them and handed them out. I am going to give this a try,it looks delicious!